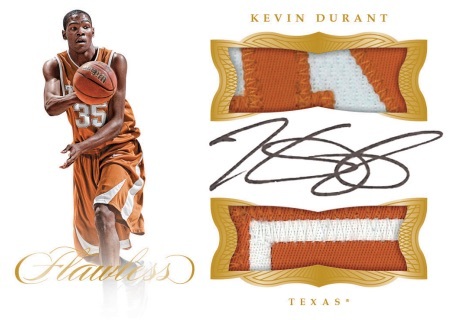 Although part of the NBA landscape for years, 2017-18 Panini Flawless Collegiate Basketball offers the debut for the NCAA version. The super high-end release packs a punch with two jewel base cards, six autographs and two other hits in every metal briefcase box. 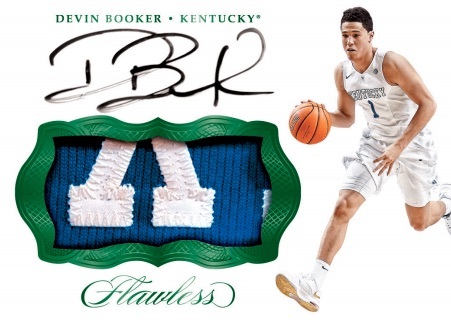 With only on-card autographs or cut signatures, the premium college set also features random team-themed boxes for elite programs such as Kentucky and UCLA. 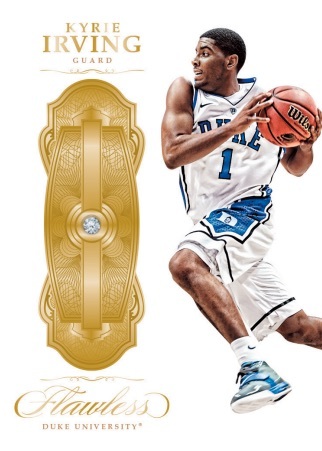 Dropping two per box, the base cards in 2017-18 Flawless College Basketball are embedded with real gems. The jewel-tastic variety includes Base Diamond (#/20), Ruby (#/15), Sapphire (#/10), Emerald (#/5) and oversized Diamond (1/1) editions. 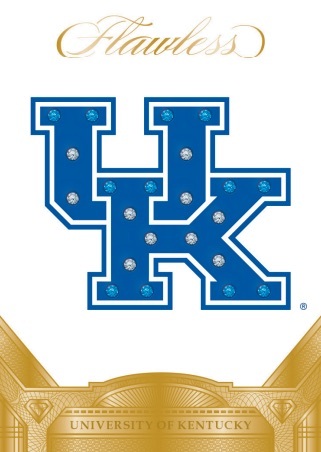 Also providing the bling, the one-of-one Team Gems insert uses multiple gemstones to enhance the school logos for UCLA and Kentucky. 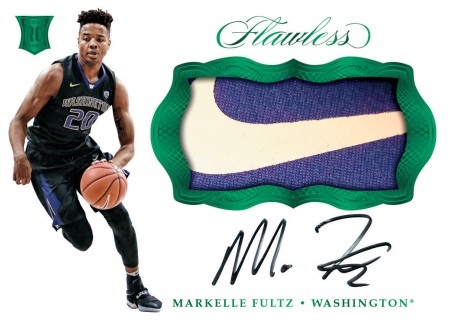 Highlighting many past All-Americans and incoming NBA draftees, the 2017-18 Panini Flawless Collegiate Basketball checklist features the top first-year players of 2017, including Lonzo Ball, with Rookie Patch Autographs. These RPA cards come hard-signed and offer NCAA Logo, Team Logo and Brand Logo patch versions. The more seasoned league players and former stars are showcased via on-card Patch Autograph and Dual Patch Autograph cards. 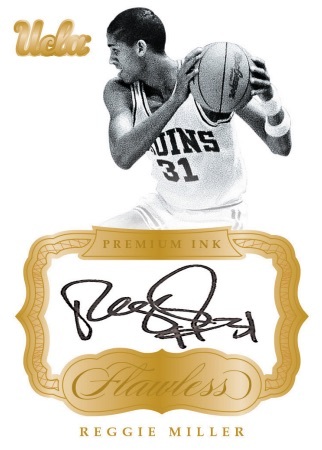 Reserved for the very best NCAA basketball players, Premium Ink also has Emerald (#/5) and Black (1/1) parallels. 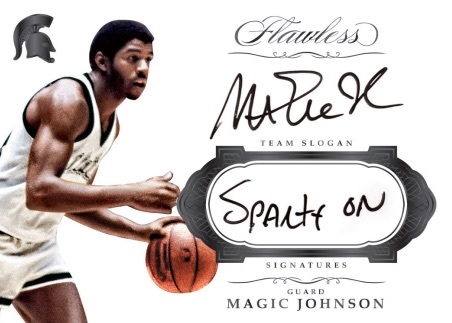 Adding a little extra, Team Slogan Signatures (#/25 or less) displays a saying associated with the alma mater in addition to the on-card autograph. There are also Dual Signature cards that pair two collegiate stars. John Wall Kentucky Auto Flawless 2017 - BBN Graded 9 - Mint. Awsome card!!!! 39 cards. Serial numbered #/25. PARALLEL CARDS: Silver #/20, Gold #/10, Emerald #/5, Black 1/1. *Cards #24, #25, #38, #39, #42 found only in Gold, Emerald, Black parallel cards. *Beasley, Turner, Russell, Griffin found only in Gold, Emerald, Black parallel cards. PARALLEL CARDS: Saphire #/20, Gold #/10, Emerald #/5, Black 1/1. *Durant, Ingram only in parallels; Murray only in Emerald, Black parallels. *Cowen, Barry, Irving, Johnson only in Gold, Emerald, Black parallels.